KWCardDesign : CAS-ual Friday Challenge 41: Jest for the Pun of it. CAS-ual Friday Challenge 41: Jest for the Pun of it. What a beautiful Sunday afternoon it has turned out to be. I wanted to share with all of you my entry for this week's CFC - Jest for the Pun of it. Make a clean a simple card, with a "punny" sentiment. 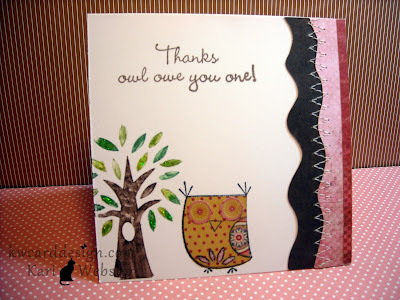 This time I chose two different stamp sets from Hampton Art- owls, and woodland animals 1 . I love this cute lil owl, and the sentiment that goes with it. Who doesn't love owls?! I stamped my owl on a piece of PTI white card stock, and stamped the same owl onto patterned paper from My Minds Eye 6 x 6 paper pad, A Happy Heart, and paper- pieced the owl onto my white card base. I am becoming a paper fanatic for 6 x 6 paper pads - especially My Minds Eye. I finished off my card with some patterned paper stitched together, and some stickles for a bit of pop. Fun card, love the pun. Cute! I love owl puns :) Thanks for playing along with us at CAS-ual Fridays! So stinkin' cute! Love the punny sentiment - it's perfection! Thanks so much for playing with us at CAS-ual Fridays - we're so glad that you did! !